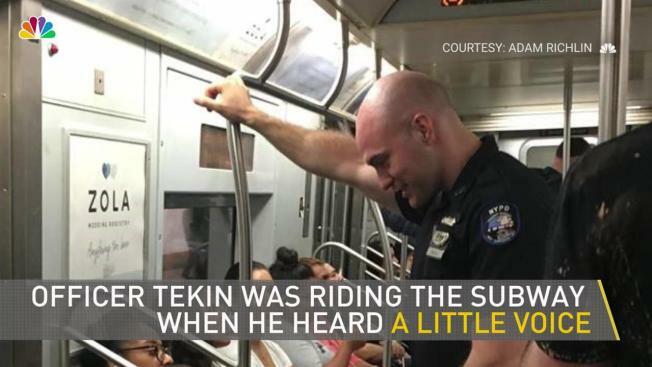 A photo capturing a special moment between a young boy and an NYPD officer on the subway has New Yorkers' hearts melting. The sweet image posted to Facebook last weekend shows a little boy looking up in awe at a smiling police officer in uniform. The boy's guardian was nearby in the subway car, though not in the shot, according to photographer Adam Richlin. The boy, whom Richlin described as "wonderfully precocious and outgoing," began peppering the officer, identified to News 4 as Furkhan Tekin of the Transit Anti-Terrorism unit, with questions. He asked Tekin why he was "wearing that stuff," according to Richlin. "Well, it's my job!" said Tekin. "Is that your favorite shirt?" asked the boy. "Yeah. Because it's the one with the shiny badge on it. I like it. You like it?" answered Tekin. Tekin asked the boy what grade he was in. The boy replied in his tiny voice, "Pre-K... and -- and I got ROBOTS on MY shirt." The boy continued to quiz the officer and asked where he was from. Tekin told the boy he was from Brooklyn, which has many different parts, and he was from one part called Bensonhurst. "Oh," the boy said. "OK. That's OK."
Richlin said the conversation between boy and cop went on for at least three train stops on the L line, and likely continued after Richlin got off at Lorimer. The boy's guardian was standing behind Richlin as he took the photo. She told Richlin: "He likes cops 'cause his mom's best friend is a cop. So he thinks they're all nice." Since it was posted to Facebook on July 15, the photo has gotten over 1,400 likes and been shared nearly 300 times. One man commented, "Most people would say, 'This is so unusual.' I was a cop for 25 years. This is an everyday accuracy." 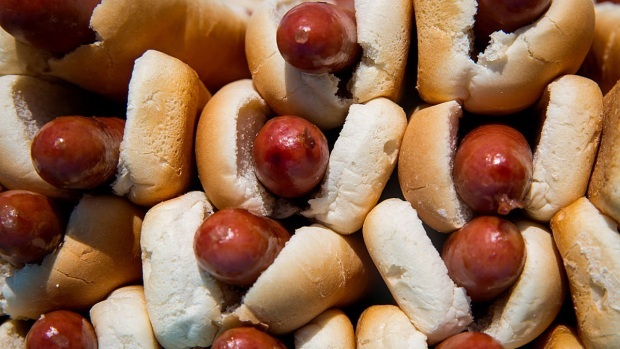 "Those 10 minutes could be something that kid never forgets," wrote another person. "You never know."